Lauren started with the farm in January 2015 on the opening day of the season. She was first introduced to the island by longtime friend Nate via a day trip that included beach time and nightlife. Soon after, she returned for a job opportunity in a new environment, beginning at Something Natural as a delivery driver. While her first impression of the island was “confusing,” she says that after three full years on Nantucket, the one way streets and rotaries have become second nature to her. Her deliveries brought her to Bartlett’s Farm, and she began working here soon after. Lauren began here at the farm as a member of the cashier team before becoming Assistant Customer Service Manager in 2016. 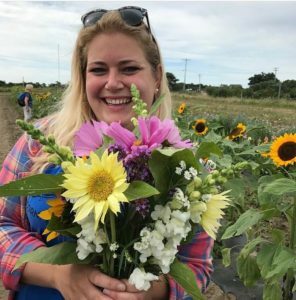 Lauren loves interacting with the regular customers, exchanging anecdotes, and working closely with friend and manager Whitney, running the customer service department at the farm.